Furnish your roll-away beds in style and comfort with the 6-inch Twin Quilted Top Bunk Bed Mattress. It is thoroughly earth-friendly and uses pre-consumer recycled content for more than half of its construction. The navy bunk bed sports a quilted cotton cover for extra comfort. It uses a blend of cotton and polyester to provide cozy warmth and unparalleled comfort. You can easily wipe-clean this bed with damp cloth. 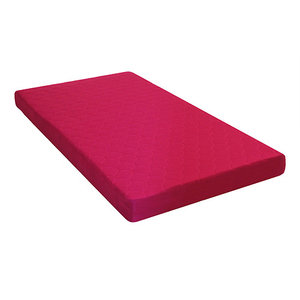 Further, the bunk bed mattress is ideal for use over a solid platform. When not in use, you can store the lightweight twin mattress easily. 6-inch Twin Quilted Top Bunk Bed Mattress: Earth-Friendly; Contains 50% or more pre-consumer recycled content Twin-size rolled mattress Ideal for bunk beds, roll-away beds and camping Quilted cotton cover Constructed with a cotton and polyester blended fiber Wipe clean with a damp cloths Top bunk bed mattress is recommended for use with a solid surface foundation (spacing between platform slats must not exceed 6 in.) Beds sold separately.